A practical addition to any work environment, our Reception Pen has been manufactured for convenience. 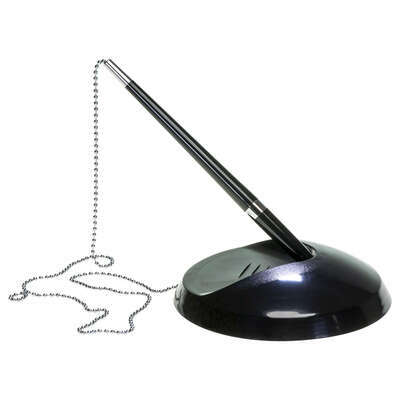 Finished in a sleek black plastic, the biro-style pen is attached to its sturdy base with a bobbled metal chain. Ensuring you always have a pen on hand for logging customers or signing for parcels, it also helps to keep offices spaces tidy and organised for a professional look. Our Office Supplies category has everything you need to keep your colleagues fully equipped. From our Staple Remover to Scissors and Tape Dispensers, you'll find everything you need right here and at exceptional wholesale prices.